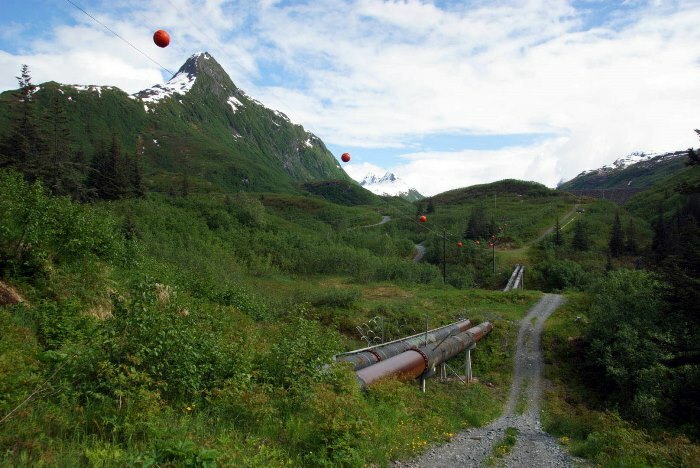 You can see Valdez from a different angle, hike a nice trail, and check out the southern end of Alaska’s oil pipeline, with a drive around Port Valdez Bay. 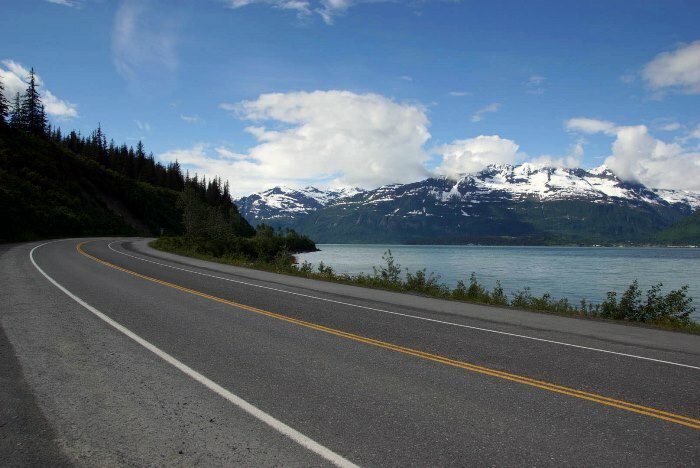 It’s all just a short drive outside downtown Valdez, and it’s all worth seeing while you’re in the area. 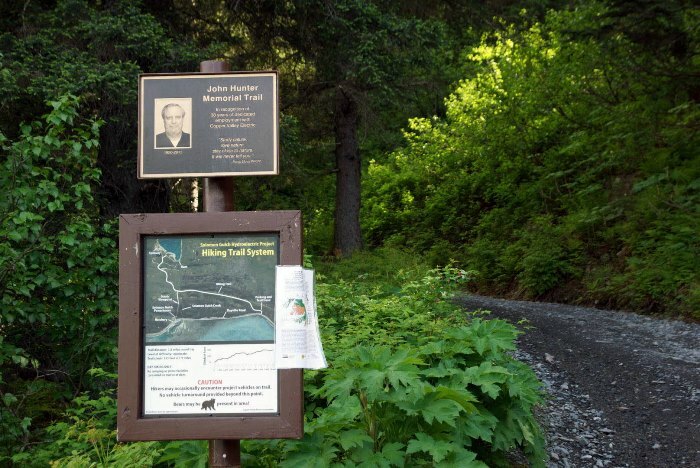 The trailhead for the John Hunter Memorial Trail is located on the south side of Port Valdez Bay (the opposite side of the water from downtown Valdez). 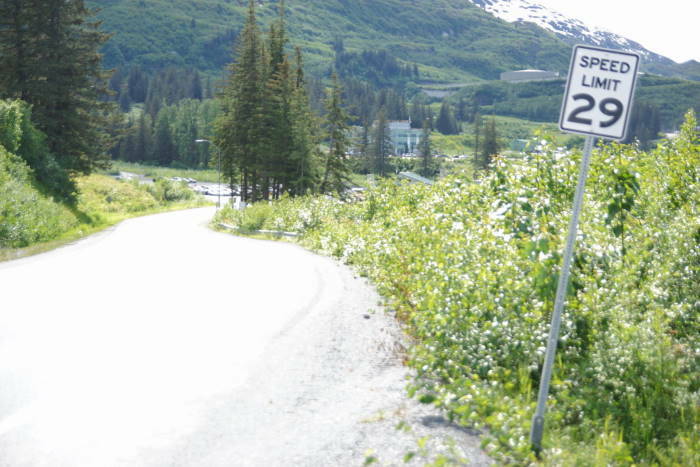 From downtown, take the Richardson Highway out of town to Dayville Road, then turn right. Follow Dayville Road almost to the end — about 4.7 miles from the highway — and watch for a parking area and dirt road on the left. 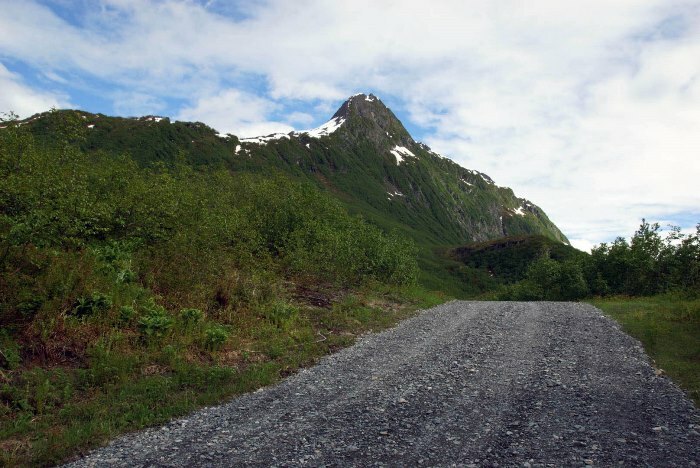 Park here, and hike up the dirt road to join the trail. There is a sign at the trailhead to let you know you’re in the right place. 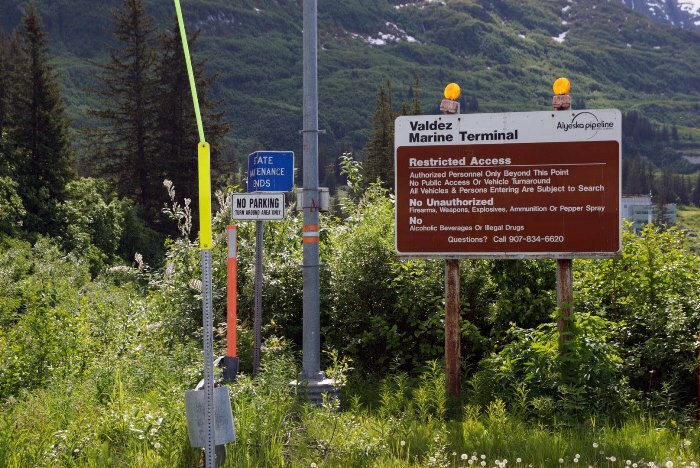 … and you’ll reach Alyeska’s Valdez Marine Terminal. It’s off-limits to the public, but it’s still worth your while to drive out here, just so you can say that you saw where the pipeline ends. Also, you get to see a very specific speed limit sign. Backtrack slightly to the trailhead for the John Hunter Memorial Trail. 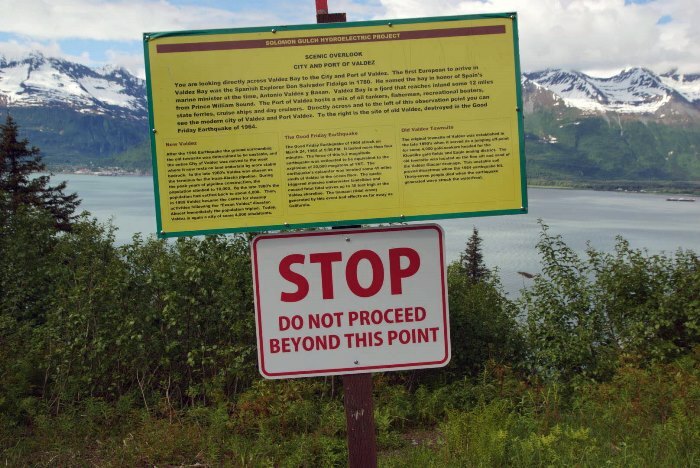 You’ll start the hike at this sign, and head up the gravel road. The gravel road takes you up the hill to a wider gravel road, which at first glance, doesn’t appear to be anything special. But, there’s a secret underground. 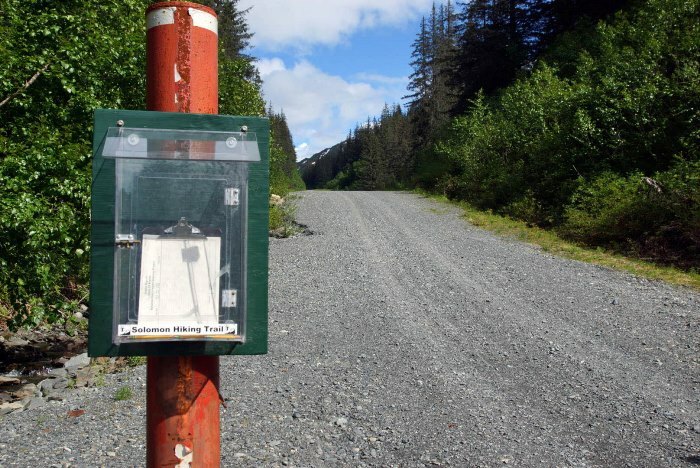 As you walk along this gravel road, you’re walking on top of the Trans Alaska Pipeline System, or TAPS, better known as the Alaska oil pipeline. Once you’ve signed in… you’ve got a hill to climb. It doesn’t look like much in this picture, but you can’t see it all. The hill is pretty steep, and there isn’t much to enjoy as you go up it. Once you get to the top, you head down the other side, all while thinking about how much fun it will be to do it all again at the end of the hike. 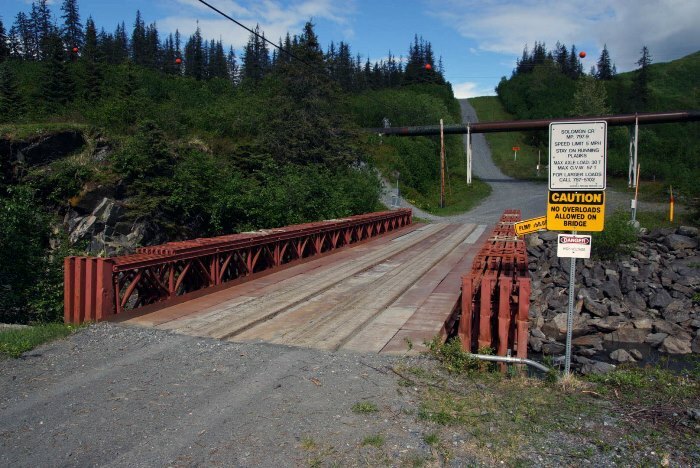 This small bridge crosses over Solomon Gulch — a narrow canyon that drains water from uphill. Solomon Lake is just up the hill to the right, and those big pipes that cross the road carry water from the lake downhill to a hydroelectric plant, down along Dayville Road. Solomon Gulch is a pretty impressive little slot canyon! 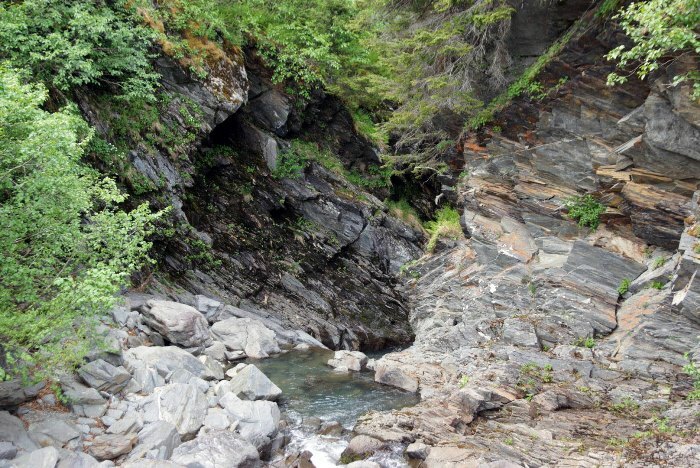 … until you reach an abrupt end to the trail. It’s not quite a perfect overlook, and aside from the informational sign, it’s not developed at all. 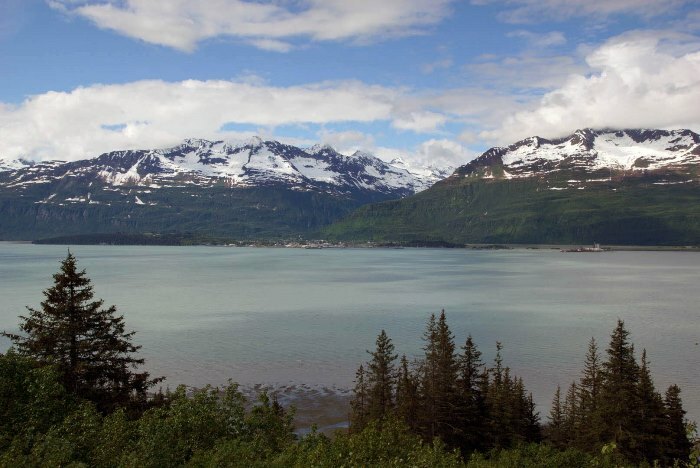 But, it does provide a pretty good viewpoint for looking across Port Valdez towards the town. That split between the two mountains is where you’ll find Mineral Creek Trail, which I hiked earlier in the day. If you dare to take a few steps beyond the STOP! sign, you can look straight down the hillside, towards the hydroelectric plant. Just follow the power lines. The current hydro power station was built in 1982. 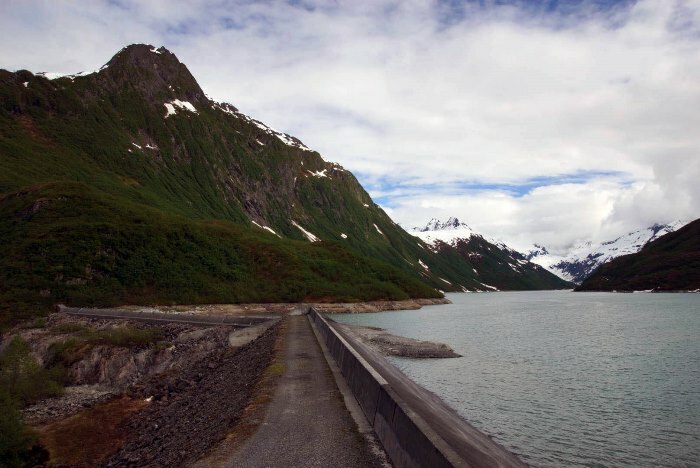 It provides power to Valdez and Glennallen during the summer months. 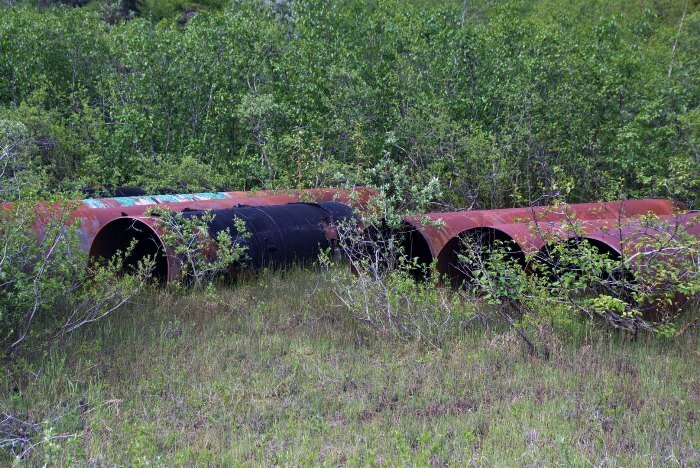 Spare pieces of pipe from the oil pipeline were used to construct the water pipes. And in the interest of following the power lines, turn around and backtrack, crossing the main trail and continuing towards Solomon Lake. It’s just up the hill, directly below that prominent peak – Sugarloaf Mountain. 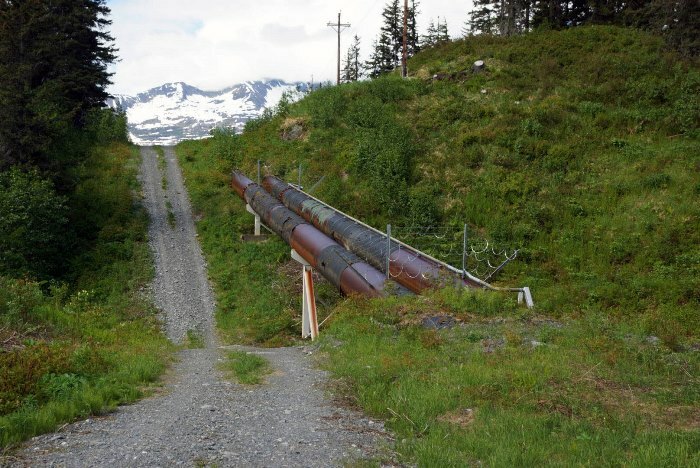 Along the way uphill, you’ll pass a graveyard for scrap pieces of pipeline. This trail certainly has a lot of uphill climbs! When you get to the end of this branch of the trail, you’ll have a nice view of Solomon Lake and Sugarloaf Mountain. You can walk out onto the top of the dam for a better look. 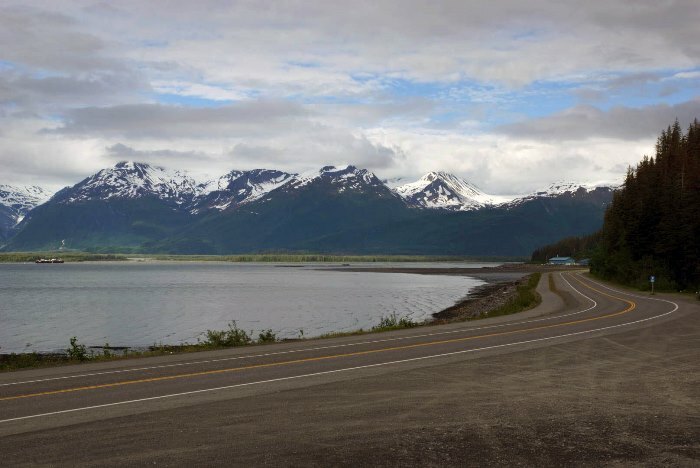 Local legend suggests that, when residents of Valdez spot the first dusting of snow on the top of Sugarloaf Mountain, winter is just six weeks away. 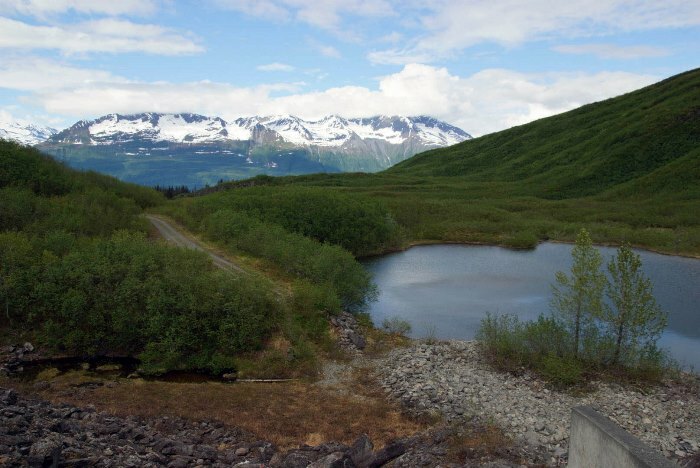 Looking downhill from the top of the dam, you can see a smaller pond, and in the distance, the mountains above Valdez. And that’s it! 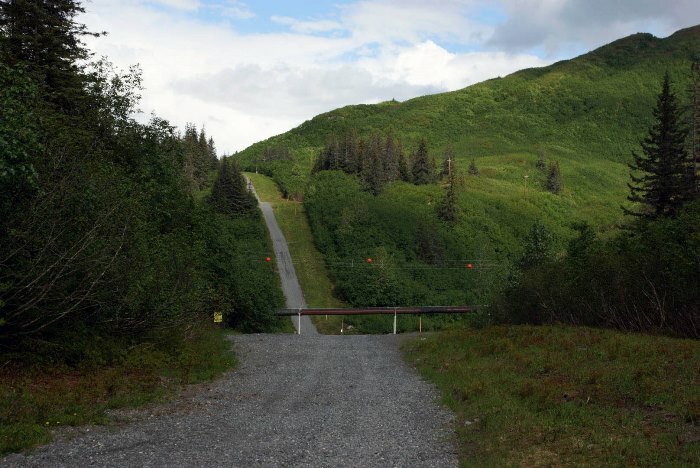 Now all that’s left is to hike back downhill to the trail junction, and then up and down a couple of humps in the gravel road, and you’ll be back at your car. 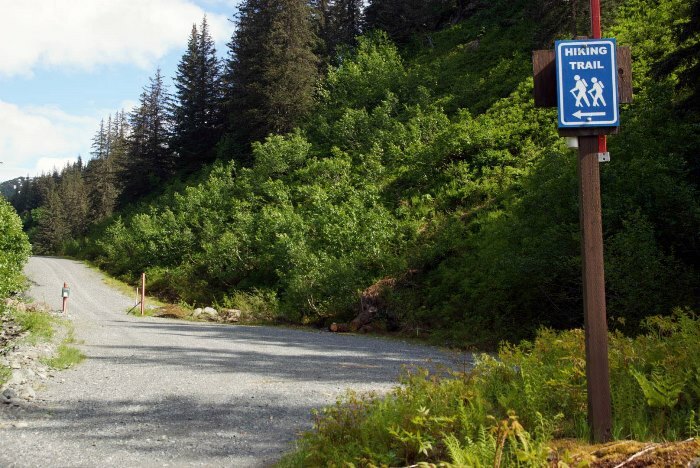 John Hunter Memorial Trail is probably the least exciting of the Valdez-area trails that I had time to hike. The viewpoint is nice, but you also get a pretty good view across the water from the edge of Dayville Road, so it’s not essential that you put all the effort into hiking up there. 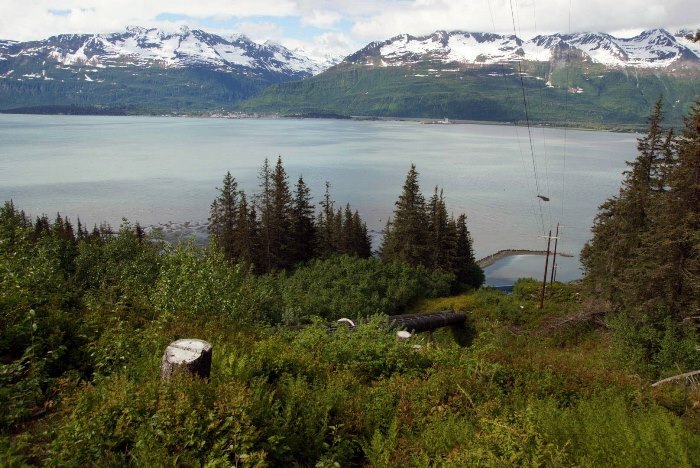 I’d suggest making this a low-priority hike — but it’s still a good idea to drive out Dayville Road, see the pipeline terminal, and enjoy the view.